"This is a combination of two fabulous marinades. My kids absolutely love it and ask for me to make it all the time! And, just by using a gluten-free soy sauce, the entire recipe is gluten free! Serve with wasabi paste and rice." Whisk tamari, sesame oil, mirin, honey, vinegar, ginger, green onions, and garlic together in a bowl until marinade is evenly mixed. Place tuna steaks in the marinade and refrigerate for at least 1 hour. Spread sesame seeds onto a plate. Remove tuna from marinade and discard marinade. Press tuna into sesame seeds until evenly coated. Heat olive oil in a cast iron skillet over high heat until very hot; cook tuna in the hot oil until cooked to desired doneness, 30 seconds to 5 minutes per side. 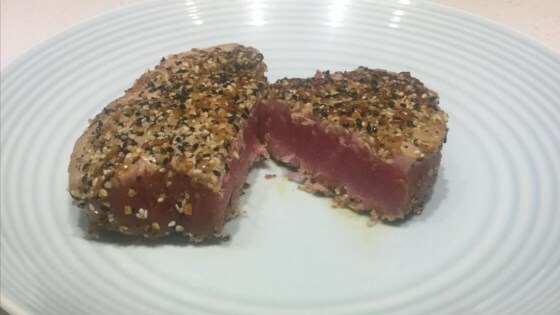 Grilling option: do not coat tuna with sesame seeds! Spray grill with non-stick cooking spray for grills. Heat grill until very hot. Grill tuna on each side for 2 minutes (for medium rare). Perfect as is. Marinated two pounds of thick ahi steaks for three hours and they were delicious after grilling. Not too sweet or too salty. Nice balance of flavors. Yummy. I will cook it for 3 minutes next time.